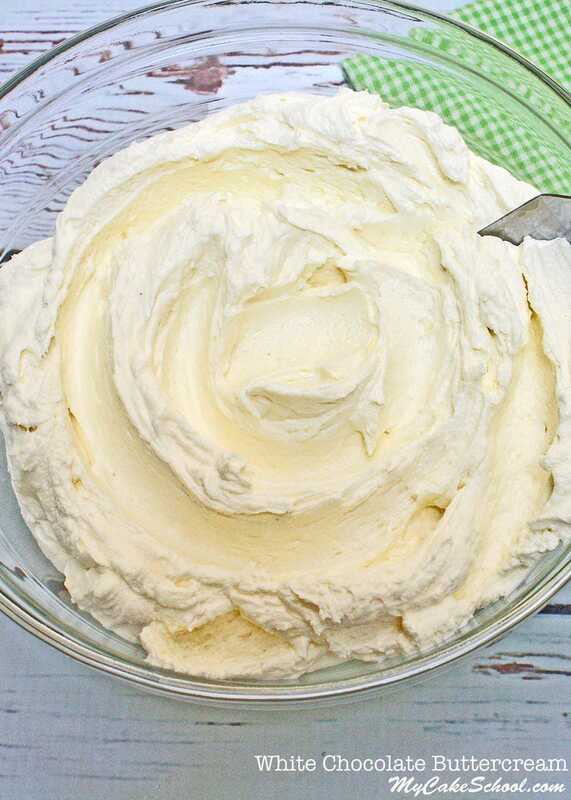 This White Chocolate Buttercream Frosting Recipe belongs in your recipe file of favorites! Not only does it have a wonderful white chocolate flavor, but it’s creamy consistency is perfect for piping. What’s not to love? If you are a fan of white chocolate, this is the frosting that you’ve been waiting for. Actually, we’ve been waiting for it too! For nearly eight years we’ve been chugging along on our cake site without a go-to white chocolate buttercream recipe. Ohhhhh, we didn’t know what we were missing! What I love most about frosting recipe is that the white chocolate flavor really shines through. The recipe calls for white baking chocolate (we really prefer this over white chocolate chips or candy melts). You are going to love the flavor. This easy-to-follow recipe involves combining the melted white chocolate with the usual key players…butter, confectioners sugar, vanilla, and milk. This luscious, white chocolate frosting is a heavenly complement to so many cake flavors. 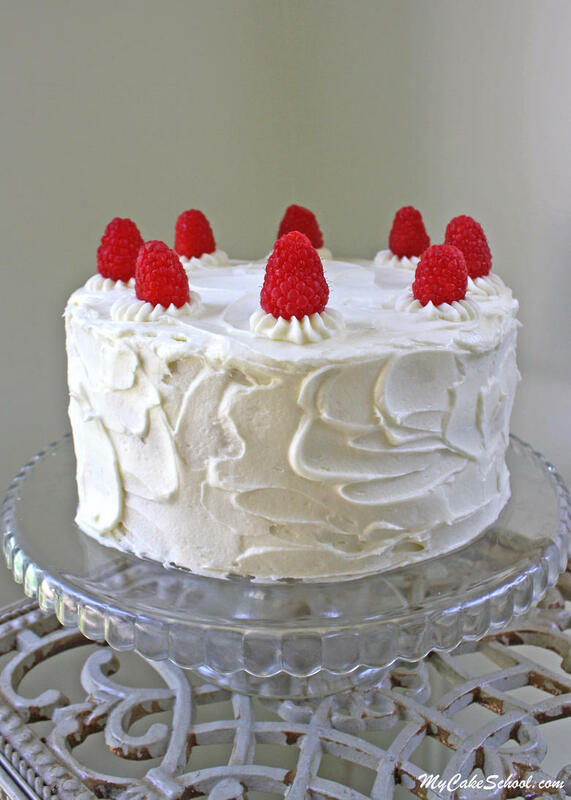 We love it with our White Chocolate Raspberry Cake Recipe, but it would be amazing with lemon cakes, strawberry cakes, rich chocolate cakes, and SO many more. Cut/chop the white chocolate into very small pieces, put into a microwave safe bowl and add 4 Tablespoons milk or cream. Microwave for 15 seconds let sit for a minute or two, stir and microwave again 15 seconds letting it sit a minute to soften further, stir. Be careful not to over heat the chocolate. The chocolate will continue to melt as it is stirred. Let the chocolate cool down before using. Beat the butter until softened and smooth, add the powdered sugar 1 cup at a time. Add the white chocolate and milk mixture. Add vanilla. Add another Tablespoon milk if needed. Beat on medium speed for 3 to 4 minutes and it will become smooth and creamy. Makes 5 cups frosting. Makes enough to frost a 2 or 3 layer eight inch cake. If you will be doing a lot of decorative piping, you will need additional frosting. ** We’ve had great results with Domino’s confectioner’s sugar and US Sugar (we buy ours from Costco). Some brands of confectioner’s sugar don’t work as well with buttercream frosting recipes. If a package doesn’t say pure cane sugar, it contains beet sugar which is more likely to give you a grainy outcome. In addition to that, we’ve noticed that even some brands that say “Pure Cane Sugar” will give a grainy consistency. So frustrating! One example is Dixie Crystals (although it used to work great for us a few years ago.) Something has changed…it’s a mystery. Anyway, this recipe should not be grainy, and so if it is, experiment with a different brand of confectioners sugar. Here’s our White Chocolate Buttercream in action, as the frosting for our White Chocolate Raspberry Cake! YUM! Thanks for stopping by! Don’t miss our full collection of favorite cake and frosting recipes in our Recipes Section! Or, if you’re interested in cake decorating tutorials, we have a Free Tutorials Section for you! Delicious, I love white chocolate cake, thanks for the recipe Melissa. The weather here on AZ the day of the party will be 99! The cakevwill be transported an hour then assembled and remain indoors. Temp will probably be 75 inside. Will this filling be stable? Would it be better to use half shortening? Thank you. Sounds delicious and will be the filling for a pink champagne cake. I made a batch as a trial, and I have some left over. How long can it keep in the refrigerator for? Will defi iteky make this for my daughter’s cake as I was looking for a white frosting receipe that covers a chocolate cake. Hi Kristin, You should be able to refrigerate for 10 days to 2 weeks if the date on the milk used was not at expiration. You can also freeze for up to 2 months. When ready to use just let it come to room temperature and remix to get a smooth consistency. So glad you like the recipe. I’ve made this icing twice, the first time it was perfect! Today I made it again, but when I bought the white chocolate, I forgot about your Kristin’s note and bought white chocolate chips. I won’t make that mistake again, too sweet and the consistency is not the same. When made correctly it is delicious! Does this frosting pipe well? I am looking to pipe roses for a cake! I made a 1.5 times batch of this and used it to frost my mom’s birthday cake. She loves white chocolate and I typical don’t love working with white chocolate frosting as it doesn’t hold its shape well….not any more!! This recipe worked amazingly well. It held shapes very well and tasted amazing. I put a little more powdered sugar in because I could then just use the entire 2 lb bag and my mom loves sweet. I also added 1/2 tsp of almond. My family LOVES almond flavoring so I typically add it to all our baked goods. This frosting works great and tasted amazing. The 1.5 times batch worked to cover the huge 3 layer cake as well as a ton of flowers and even had a tiny bit left over. Will use again for sure!! Usually I have to make two frostings for her cakes – one that is white chocolate and one to decorate with but with this one, I can just make one. Thank you!!! Hi Sarah, This frosting does pipe well. Hi Marcy, Thank you so much for posting your picture. Sarah who asked about piping will be able to see the various piping techniques you used on your cake. The cake is lovely and I’m sure your mom was thrilled. Thanks for your nice review of the recipe!! Hi, everyone! I made this frosting and the flavor was wonderful but the consistency was too soft to pipe and hold its shape. It also never developed the slight crust I was expecting. I followed the recipe but did add a bit more milk, as the buttercream was initially quite stiff. I’m thinking I added too much liquid? Has anyone else had a problem with it being too soft? Hi Kate, I’m sorry you had a problem. 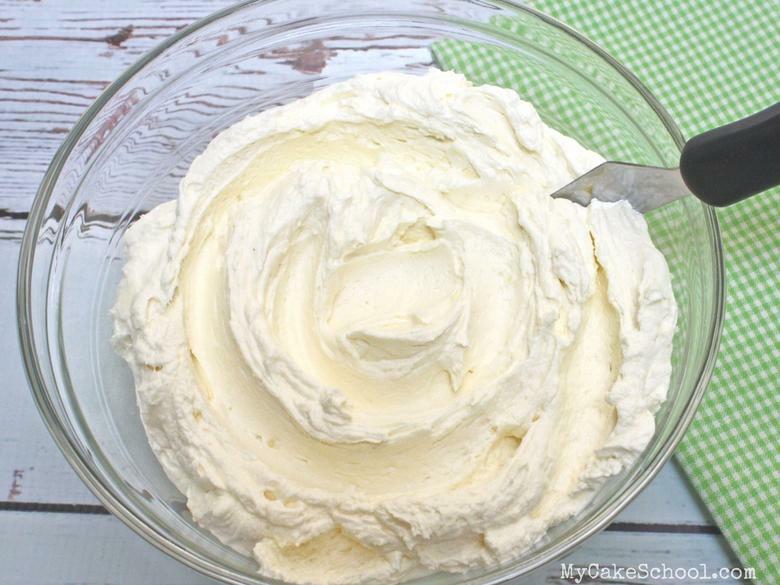 If the buttercream is too stiff, add additional milk a teaspoon at a time as it can go from stiff to soft quickly. Once it is too soft you will need to add additional powdered sugar. The next time you make this, add the powdered sugar gradually, you many not need all of it. Thanks for your insight—I really do think it was the extra milk! I was in a rush and didn’t measure out the additional milk carefully and it did go from stiff to soft in a split second, as you noted. We all loved the flavor, though, and next time I’ll know to measure out the extra milk carefully! Hi Fabiana, Thank you, I’m so happy you like the recipe! Hi there! Do you happen to have a dark chocolate or milk chocolate buttercream receipe? I really love the white chocolate receipe but wanted to do a regular chocolate one in addition for my daughter’s birthday party. Thanks!! Can I use this white chocolate frosting under fondant without getting too soft? Hi Wally, I’m sorry but we have not used this frosting under fondant so I cannot be sure it would work well. It is piping consistency and will form a slight crust. If you give it a try, and it’s softer than you want, you can add powdered sugar to reach the desired consistency. You’ll want to let the filled cake layers settle as usual before applying the last coat of frosting to prevent bulging. Give us a follow up if you use the recipe. Hi Wally, as Mom said above, we haven’t tried this under fondant but I really think that it would be fine. If you give it a try, you’ll want to chill your frosted tier just until the frosting is firm (maybe 15 minutes in the freezer)- before applying the fondant.